September 21, 2018 in Boone, North Carolina. Catherine Faherty and co-presenter Jade McWilliams, Artist, Activist, and Autistic Advocate, provide a full-day seminar for teachers, therapists, and other professionals who work on behalf of children and adults on the autism spectrum; autistic adults, friends and allies, parents and family members. This day-long seminar covers the essentials of how to foster authentic self-knowledge and self-advocacy, including when to talk with your child about autism, and how to nurture self-understanding in open and positive ways. Practical, accessible strategies to teach self-advocacy skills will be presented. When autistic children are raised without self-knowledge and without a daily practice of autism-friendly ways of communicating and asking for help, they may be more susceptible to physical and emotional harm. The consequences of not including these important goals in an authentic manner in a student’s educational program will be discussed in an honest, straightforward, and compassionate manner. Learning to “speak your truth” with confidence – and to first know what your truth is – is most possible with a strong foundation of personal awareness, accessible communication, authentic choice, and mutual respect in the environment. Trigger warning: Emotional, cognitive, physical, and sexual abuse will be mentioned. 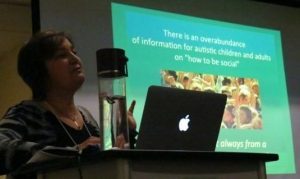 This very affordable full-day presentation ($20 for professionals, $10 for students, families, and individuals on the autism spectrum) is being organized by the Hub for Autism and Neurodiversity (HANd) and is partially funded by the NCDD (North Carolina Council for Developmental Disabilities). Contact Elizabeth Kerley (Elizabeth.kerley@apphealth.com) or 828-264-4995 ext. 3114 for more information.